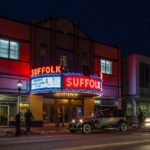 The mission at The Suffolk Theater is to re-establish the cinema/ playhouse tradition in downtown. The last five years has been a fascinating restoration process of the Art Deco cinema space into a full- service performing arts center. The theater will be providing diverse programming for all ages, from live entertainment, music and plays to movies and catered affairs. Programming onstage at the Suffolk Theater will range from Country to Comedy - from Classical to Contemporary; the very best touring artists available - our goal is to bring a broad range of performing artists to the Suffolk Theater stage that will appeal to every resident and visitor to the east end of Long Island. 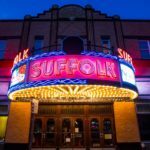 The Suffolk Theater's state of the art marquee, seen by over 15,000 people daily and has become an information center and part of the identity of Main Street, The theater itself is projected to bring more than 4,000 visitors to downtown Riverhead weekly. Riverhead, Long Island, NY is strategically situated and easily accessible to attract audiences from a broad geographic area as well as second home owners heading further east for weekends. Identified as both an historic district and an arts district, Riverhead is poised to come back as a vibrant center of activity. East End Arts' Gallery and School of the Arts and Suffolk Theater are situated across the street from one another on Main Street.